For the past two years, the University of Wyoming’s Stable Isotope Facility (SIF) has been the go-to laboratory to analyze National Ecological Observatory Network (NEON) soil samples from all across the country. Based on that solid soil work, the facility has added plant samples to its research list. Nearly two years ago, Craig Cook, SIF director, and Chandelle Macdonald, the laboratory’s manager, made the successful proposal to NEON to secure the three-year, $80,000 contract to analyze soil samples from the entire NEON network across the United States. This time, however, NEON came to the UW facility for assistance. While the soil contract with NEON is for three years, the contract to analyze carbon and nitrogen levels in various plants -- approximately 3,500 samples collected during 2014 and 2015 -- is set up on a year-to-year basis. The National Science Foundation created NEON Inc., a nonprofit organization, and is funding the project at $434 million. NEON, based in Boulder, Colo., employs its own staff; purchased all of its equipment and instrumentation; and collects soil, plant, water and animal samples for analysis. NEON is designed to gather and synthesize data on the impacts of climate change, land use change and invasive species on natural resources and biodiversity. Using instrument measurements and field sampling, data are collected from 106 sites (60 terrestrial, 36 aquatic and 10 aquatic experimental) across the U.S. (including Alaska, Hawaii and Puerto Rico). The sites have been strategically selected to represent different regions of vegetation, landforms, climate and ecosystem performance. The packets of plants -- sent in nondescript yellow manila envelopes and labeled by number -- are akin to a horticultural Cracker Jack box. Researchers don’t know what’s inside until they open up the packets. She says there are 14 NEON domains, which are based on topographical differences. These terrains can include coastal, desert and wetlands, among others, Cook says. Macdonald says approximately 1,000 samples -- of the roughly 3,500 they will analyze -- have already come to the lab and are being processed. 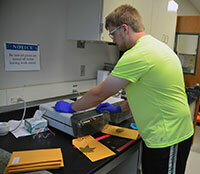 Alex Moss, a junior from Littleton, Colo., and majoring in chemical engineering, processes many of the plant samples that come into the lab. The samples arrive as full leaves, many with stems intact. He first places the sample in a small, steel tube jar. A small metal grinding ball is placed in the jar with the samples. The jar is placed on a grinding machine or ball mill, which shakes up the jar and its contents inside. The elemental analyzer produces carbon dioxide and nitrogen gas, which are analyzed for carbon and nitrogen isotopes in an isotope ratio mass spectrometer. Samples are then logged into a computer database. Like the soil samples the SIF handles, Cook stresses that, whatever numbers the lab generates for the plants, that’s where their work stops. It is not their job to interpret the data. That is left to NEON, which is gathering the data to look at ecological climate change over a 30-year period, Cook says. Still, Cook says carbon and nitrogen levels found in plant leaves and their stems can provide important information about stress levels on plant species, which can occur from water, humidity and temperature.